Our class this week took a deep dive into the multitude of social media platforms that are now a part of our everyday lives. I have to admit it came as a surprise to me how many different platforms are out there. 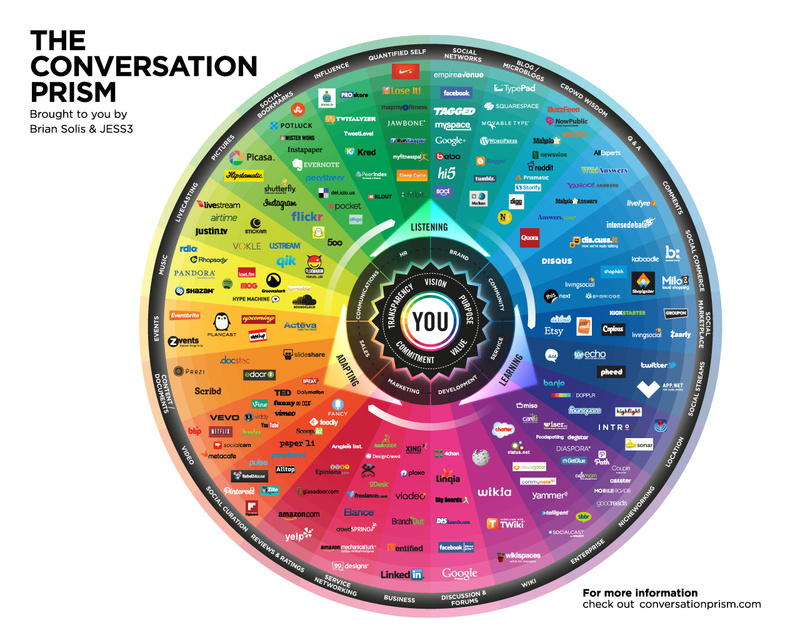 A great illustration that was part of our discussion is this chart called the Conversation Prism. It’s a visual map of the social media landscape and was first created in 2008 by digital analyst Brian Solis. The prism, which continues to be updated, tracks the latest in social media platforms and organizes them by category. Once I started exploring it I realized how much my engagement with social media goes beyond the usual suspects like Facebook, Twitter and Instagram. It’s staggering to think how many of these platforms have become a part of our lives in a short span of time. A recent Pew Research Center study shows 65% of American adults use social networking sites. That’s almost a tenfold increase since 2005. During our class discussion, each of us did an analysis of a social media platform. Some of them were familiar to me like Yelp, Reddit and Snapchat. But others were new including a photography blog called Strobist, an online image sharing community called Imgur and a Q & A website organized by a community of users called Quora. After each presentation, I thought, “I’d like to try that platform”, but the reality is all these social media options are starting to feel like an all you can eat buffet. At some point, you have to push yourself away from the table. A second look at the Pew graphic shows a similar reflection. 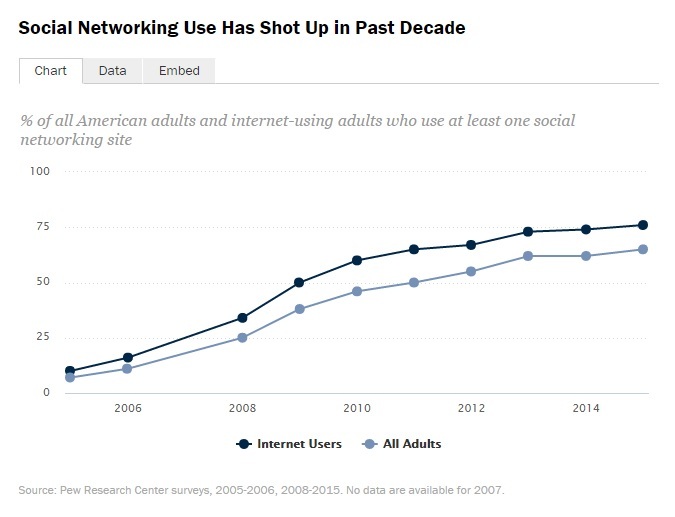 While the number of users shot up over the past decade, the overall number of users of social networking sites has leveled off since 2013. As the saying goes, “All good things in moderation”.